It’s time to start the project that I alluded to on Tuesday! Did you gather your magazines this week? How about the poster board in a standard frame size, approximately 11” x 14”? You’ll also need scissors and glue. Start looking through your magazines and picking out words, phrases, or pictures that indicate changes you want to make or what you want your life to look like. For example, “hope” and “healthy” would work for depression. If you’re trying to also beat a bad habit, “clean” or “fresh” could be meaningful. These are only examples. Each person is unique, so whatever your issues are in addition to depression can be included. Take your time, and really think about it. After you’ve cut them all out, arrange them on your poster board. I’m a fairly methodical person, so you’ll notice in mine above that I didn’t have any overlap and had a central figure, with everything else on either side. (I’m always shocked when people who know me ask if that’s a picture of me. It’s from a Nike ad. I look nothing like her.) Your arrangement doesn’t have to be like that. Yours can be more haphazard and have overlaps. Or more methodical. Do it in a way that’s comfortable for you. There aren’t any rules for this. If you plan on framing your collage, you might want to leave a little room around the edge to account for your frame. After everything has been arranged, glue your clippings in place. 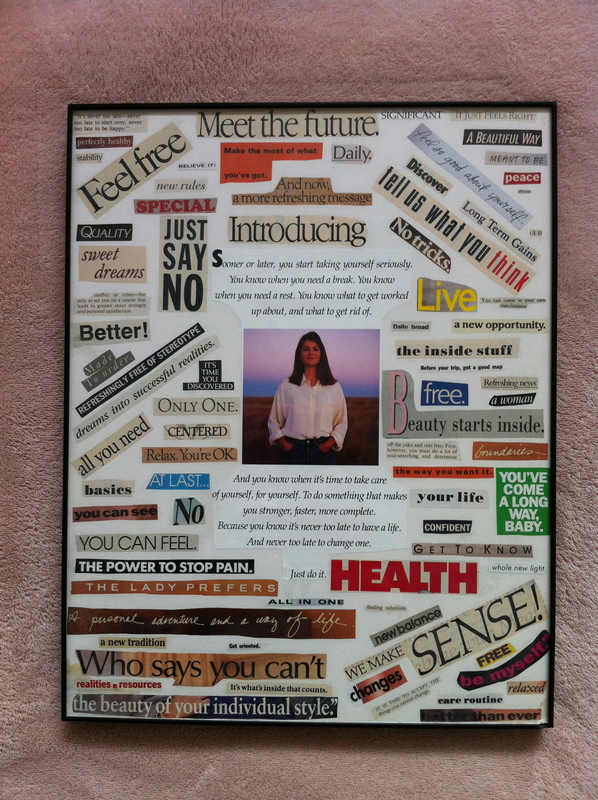 It’s been over 20 years since I was given the diagnosis of major depression and panic attacks, but I still have this collage hanging in my bathroom. It is a reminder of the healthy life I was determined to achieve. And, in time, I did! YOU WILL, TOO! I hope this art project will be as meaningful to you as it was to me. Enjoy your project this weekend, and I’ll be back on Monday.